This nail art is dedicated to all who are broken-hearted or sad. Hopefully, this nail design can bring a smile to our faces. I've recently been gifted with a nail art brush set and this is the first time that I used it. Freehand designs are challenging for me, specially when I'm doing my right hand. I think the dotting tool would be easier to handle. I'll try that soon. 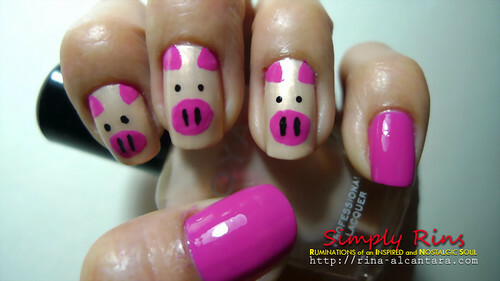 I simply called this nail art The Three Little Pigs! 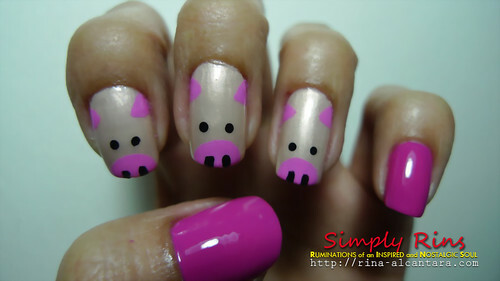 I painted the 3 pigs on my pointer, middle, and ring finger. I used Zoya Buffy as base color and Faceshop PK104 for the ears and snout. For my thumb and pinky, I used Faceshop PK104 as base color. I topped everything with a layer of top coat. I apologize for not having too much photos for this nail art. I just intended to play around with my nail art brushes and ended doing both my hands without remembering to take pics. I will be redoing this design soon with the dotting tool set that I also just recently acquired. I promise more pics on how I did the design. 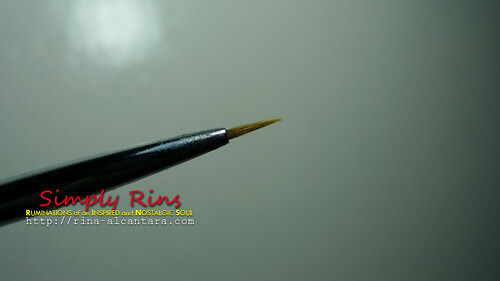 This is the nail art brush I used for painting the pig's ears and snout. I did 2 versions for the snout. The first photo has a full snout. In this picture, I drew the snout on the tip of my nails. I like this better than my first attempt with the full snout. How about you? Which do you prefer? they are both adorable!!! I like the tip one better also though, but really, they put a smile on my face! thank you. This is just freakin adorable! they are both very good. My vote is the tip one. Thanks so much for your compliments! :) I need all the smiles that I can get. aww cute little pigs! i prefer the second attempt :D good job!